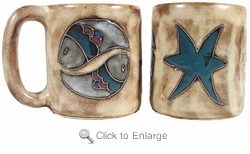 Mara Stoneware Zodiac - Astrology Coffee Mug - Pisces is the mutable / water sign. Pisceans adapt emotionally to their environment. Often painfully shy, they are adept at imitating the mannerisms of other people in order to hide their own personalities.